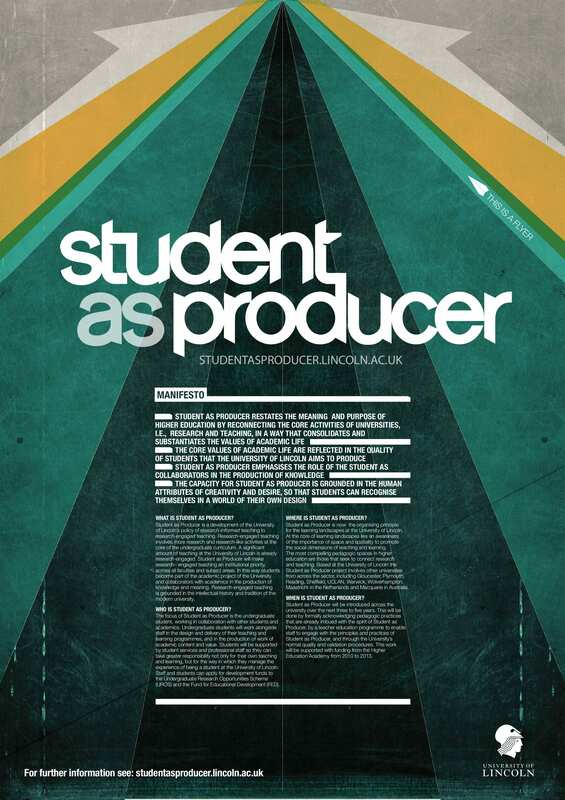 This is a section of a report on Student as Producer at the University of Lincoln written by Mike Neary, Gary Saunders, Andy Hagyard and Dan Derricot for the Higher Education Academy (HEA). Student as Producer was funded by the HEA as part of the National Teacher Fellowship Project Scheme in 2010-2013. The full report ‘Student as Producer: research-engaged teaching, an institutional strategy’, has now been published by the HEA. 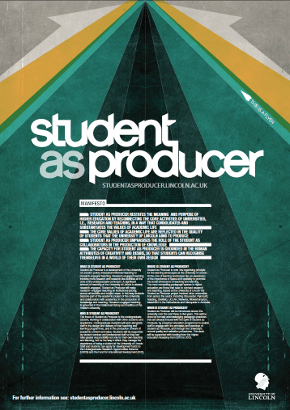 This is a guide to building or making or hacking your own version of Student as Producer, based on its core themes and ideas. It’s given away as a gift: an ‘excessive offering’ (Mauss 1967) in a spirit of abundance (Kay and Mott 1983): ‘from each according to their ability, to each according to their need’ (Marx 1875). The spirit of abundance is the horizon scanner that just might get us into the future (Dean 2012). Find your own way. Do it yourself with others. No one will ever to do it the way we have done it. Have some; not just ‘good’ or ‘novel’ ideas, but ideas self-consciously grounded in the intellectual traditions out which they have emerged. It is these intellectual traditions that give ideas substance, providing rich encounters for those who seek to investigate them fully. Student as Producer is derived from a Marxist critique of orthodox Marxism: a negation of the negation (Hegel 1874) – the positive power of negative thinking (Noys 2010). You are working in an academic environment so your ideas do not need to be consensual; indeed they should be uncompromising, Brutalist even (Meades 2014), to provoke challenge and critique. Avoid the overuse and under theorisation of affirmative concepts like ‘innovation’, ‘excellence’, ‘enterprise’, ‘co-producers’, partners’ and ‘engagement’. Only use these notions once you have discovered the full extent of their intellectual provenance and the assumptions on which they are based; otherwise they are likely to be seen as management fads and be unsustainable in the long term (Birnbaum 2001). You may have to defend your ideas, and you should welcome it. Students are taught to mistrust and critique evidence and data. Science knows that facts do not speak for themselves. All data from the natural and social sciences is the outcome of the assumptions of the scientific tradition on which it is based. It is important that all data, including management information, is subject to the same rigorous application as your own experimental science, maintaining a sense of ‘dynamic enquiry’ (Fuller 2003). Produce your own evidence based on your own scholarship of teaching and learning, grounded in your own scientific assumptions, explaining why you have chosen your methodology and methods against other forms of investigation. Remember, data is only science to the extent that it is falsifiable (Popper 1977). Learn from the Arts and Humanities. Think hard about how you present yourself and your work: write a narrative or story or draw a picture to express the current state of play with regard to your teaching and learning plans. Use painterly and writerly techniques: montage, cut ups, streams of consciousness. Express what you know and what you have produced in a critically intelligent way, reflecting the ethics and values of your work, with a sense of its own emotional aesthetic. Artists and writers know that not everything has to be explained, but can be left unsaid, to provoke and incite, all of which add to the intensity of the experience of higher education. The Student as Producer aesthetic is taken from Jacob Epstein’s ‘Rock Drill’ (1913-15). Remember, teaching can be your greatest work of art (Lambert 2011). Do not try to change your institution. Much better to affirm what is special about your institution and celebrate it. At Lincoln we had a Festival of Teaching and Learning not as an event to which staff and students were invited, but by opening up our classrooms, labs and lecture theatres to each other and inviting staff and students to join with what we are all doing. Not just teaching and research staff, but colleagues from Finance and the Secretariat and Student Services and Estates and Catering as well as the porters and cleaners: the full range of academic labour. Find your own ways to express the uniqueness of your own institution as a place of higher learning, and then make it more. At the same time, embrace the contradiction that lies at the heart of higher education: we may have different institutional histories and cultures, but what we all have in common is that we are all concerned with the production of knowledge and meaning. It is only through commonality that solidarity and real change occurs, not simply at the level of the institution but at the level of society. Remember, ‘Philosophers interpret the world the point is to change it’ (Marx 1845). This is what is meant by sublation. Students are a special life-force, but they are not at the heart of the university system. Student as Producer has identified the heart-beat of the system as the production of knowledge and meaning. Knowledge and meaning can be produced in collaboration with students through the teaching and learning process. Academics maintain their authority but gain stature by presenting themselves as part of a ‘mass intellectuality’ (Hall and Winn 2014) and the ‘general intellect’: knowledge at the level of society (Neary 2012). Students can advise us and be consultants about teaching and learning and how we can improve their experience (Crawford 2012), but academics cannot expect them to know the nature and purpose of higher education: that is our responsibility as academics. And remember, academics are students too, with much to learn from other students about how to be students and how to be teachers (Freire 1970). You will need to build, repair and refurbish your infrastructures to provide a firm foundation for your project so that it can be embedded across the whole institution. Start with your bureaucracy, not simply as a system of technical procedures, but as a moral and ethical framework. Following the work of Max Weber (1864-1920), reinterpreted through contemporary sociology, bureaucracy is ‘a site of substantive ethical domain’ (Du Gay 2000: 2) and ‘a particular ethos … not only an ensemble of purposes and ideals within a given code of conduct but also ways and means of conducting oneself … the bureau must be assessed in its own right as a particular moral institution and the ethical attributes of the bureaucrat be viewed as the contingent and often fragile achievements of that socially organised sphere of moral existence’ (Du Gay 2000: 4). In this way, the bureaucratic environment contains its very own rationality and sense of purpose (Du Gay 2000: 75) against the amoral networked principle of our contemporary digitised society (Kleiss et al 2011). Your teachers will need support, probably more than you will be able to give them. Create formal spaces and time for teachers to discuss and show their work to each other outside the normal performative events that exist within the audited university. This can be done inside staff development programmes and by encouraging staff to take teacher qualifications, particularly the Post-Graduate Certificate in Higher Education. The qualification is an important recognition of your professional accomplishments; but, more significantly, these programmes can provide time for rigorous critical reflection and review of our own academic practice on our own terms. You can enhance what support is provided formally by creating informal networks of teacher support,e.g., like the Teaching Academy at Lincoln. These (in)formal spaces enable connections to be made with conscientious and committed teachers who may have become disaffected with the commercialisation and heavily audited nature of academic life, characterised by performance measures, student as consumer and the pedagogy of debt. Harney and Moten (2013) have identified this group of academics as  ‘the undercommons’, who are ‘always at war, always in hiding’. You should find ways to connect with these colleagues, they have much to offer. The learning environment starts from the curriculum, but this needs to be enhanced by the design of learning and teaching spaces, where it is possible for you to do this, at the real (spatial) and virtual (temporal) level: to create a new pedagogy of space and time (Neary and Amsler 2012) . What kind of classroom space might reflect the democratic and collaborative practices and principles of Student as Producer? Such a classroom already exists: The Reinvention Classroom at the University of Warwick. This space is profoundly utopian-modernist in its sensibility, Brutalist, even (Hatherley 2011). It was created as ‘a machine for teaching ’ (after Corbusier), as a ‘psycho classroom’: or a work of art ( Lambert 2011 after Beuys). One national newspaper reported it as:  ‘The Learning Mould is Smashed!’ (Independent Education Section 2007). The room was designed to dissolve the distinction between student and teacher, i.e., to remove the ‘power-point’ from the classroom, providing a fluid and dynamic democratic complex space, certain of its sense of architectural and critical intelligence; and profoundly anti-flexible (Neary and Saunders 2011). Student as Producer is an experiment, grounded in an inductive (empirical) and deductive (non-empirical) methodology. It makes no claim to be new or innovative, seeing itself as a brief moment in the radical history of the university (Williams 2006). Scholars write their own histories of higher education, ours begins with the University of Berlin (1812), fast-forwarded to Universities in Paris and Italy in 1968 when students were not merely engaged, but were ‘revealers of a general crisis’ (Ross 2012), and brought up to date by Occupy and the student protests in the UK in 2010-2011 (Neary 2012). What can we as educators learn from Tent City University (Stanistreet 2012). A part of this experiment is teaching ourselves the basics of our own radical history. You should experiment based on what you know about your own institutions and what other universities have done. Look for the history of experimental science outside of your institution. At Lincoln we found the astonishing figure of Robert Grosseteste (1175-1252), Bishop of Lincoln and first Chancellor of Oxford University. Grosseteste is recognised by medieval historians as playing a key role in the development of rigorous (falsifiable) research methods within a sound conceptual framework based on the origin of light, i.e, Grosseteste established the basis for inductive and deductive research methodologies (Neary 2012). What light can you throw on the unrecovered history or your own institution and its location? Following Mathiesen and his ‘politics of abolition’ (1974), your work to reinvent your institution through experimental science is never finished. Mathiesen argued that ‘the alternative lies in the unfinished: in what is not yet fully existing. The “finished alternative” is “finished’ in the double sense of the world… The alternative is “alternative”…in so far as it contradicts and competes with the old system [as a form of] competing contradiction’ (p.13-14). Starting from ‘the unfinished’ does not mean that Student as Producer is forever, but that the form in which Student as Producer is produced will itself be transformed [sublated] in ways that are appropriate to the moment in which it has come subsist, or it will die. In other words Student as Producer must reinvent itself as yet another subversive form of higher learning if it is ever to be fully realised. Student as Producer is a recognition of the critical impulse of higher education: Student as Producer and the University cannot be contained. Neary, M. and Winn, J. (2009) ‘The Student as Producer: reinventing the student experience in higher education, L.Bell, H. Stevenson, M.Neary (eds) The Future of Higher Education: Policy, Pedagogy and the Student Experience, Continuum, London. Please see below a version of a proposal submitted to the HEA in April 2014 for funding, £20,000, under their Students as Partners initiative. The proposal was not deemed suitable for funding. The participants involved with this research project are currently considering other sources of funding. Student as Producer has played a leading role in developing the concept and practice of Student as Partners nationally and internationally (Levy 2013, NMC/Educause 2014). Student as Producer has been led by Mike Neary, who is ‘widely celebrated as one of the most radical thinkers in higher education today’ (Warwick Universities Summit 2014). Mike Neary was awarded a National Teaching Fellowship by the HEA in 2007. He taught Sociology at Warwick 1994-2007 where he was the Director of the Reinvention Centre, a Centre for Excellence in Teaching and Learning. He has been Dean of Teaching and Learning at the University of Lincoln since 2007. Mike has been invited to speak about Student as Producer at more than 50 teaching and learning conferences in last three years. He has an extensive national and international network, and has acted as advisor and consultant on Student as Partners projects in other institutions. He is a founding member of Social Science Centre, Lincoln, a co-operative providing free higher education, in which students run and manage the centre in collaboration and co-operation with academics. This initiative has attracted considerable public interest, with feature articles in The Times Higher Education (May 2013) and the journal of the National Institute for Adult and Continuing Education (2012). The Social Science Centre, Lincoln is part of a transnational response by academics and students to create forms of higher education that are alternatives to ‘academic capitalism’ ( Slaughter and Rhoades 1994). Professor Neary will be the lead investigator on this project. Mike will be relinquishing his post of Dean and Teaching and Learning in April 2014, when he will become Professor of Sociology in the School of Social and Political Sciences. He has research leave during the period on which he will be working on this initiative to which he will give two days per week. Ana has published extensively on Argentine and Latin American labour and social movements and the state, on autonomous organising and emancipatory struggles, hope and prefiguration, in both indigenous and non-indigenous, rural and urban contexts in Argentina, Bolivia, Brazil and Mexico and done theoretical work on subjectivity and emancipation. Ana’s research seeks to understand and explain the means by which groups of people outside institutionalised political structures can affect social and political change. She have pursued this orientation through a focus on labour and social movements, and movements of protest. Ana is now working on movements of protest as a response to the capitalist crisis in Europe and worldwide. Her work challenges the ‘claim-making’ definition of the role of social movements by shifting the focus towards their constitutive function as vehicles for the creation of ‘alternative’ (new) worlds and their capacity to inspire social scientists to adopt ‘hope’ as a method of enquiry of social reality. Dr Dinerstein will be contributing ten days of her time to the project. Giggi is a founder member of Edu-factory which started in Rome, Italy, in 2006 and spread out all across Europe and beyond. Edu-factory is a form of academic activism, which emerged to confront the future of the university in the context of the global crisis of capitalism. He has worked since 2006 at the University of Bologna on a range of projects funding by European grants on issues to do with migration, gender and digital technology. He is the author of the widely acclaimed ‘Living Knowledge’ published in 2011. For Roggero, living knowledge is something that is constituted through class struggle, co-operation and radical practice. The purpose of class struggle in this context for Gigi is to turn the crisis of the university into a field of radical research in order to investigate and produce living knowledge (Roggero 2011: 29). The book has had a very significant impact on academic activist thinking in Europe and transnationally. Dr Roggero will be contributing ten days of his time to this project. Mike Neary, Ana Dinerstein and Giggi Roggero are part of a wider group of collaborators who constitute a core part of the organisation for this research project. Students will form an important part of this group of collaborators. If successful the project will make a call for students to join this group and to attend the first workshop event in May/June 2014 and be important partners for the duration of the project: collaborating on the planning, writing and taking part in the research in the UK and Europe. Student as Producer has played a leading role in developing the concept and practice of Student as Partners nationally and internationally (Levy 2013, AMC/Educause 2014). What makes this proposal highly distinctive is that Student as Producer is distinguished from mainstream approaches to Student as Partners by its reliance on critical and popular pedagogies, inspired by the work of Paulo Freire, bell hooks and Walter Benjamin. The key difference between mainstream and critical pedagogies is that the former prioritise transformation at the level of individual students within a framework of the ‘business university’ underpinned by the principles of entrepreneurship and public engagement; while the latter promotes transformation as a collective activity at the level of the institution and society within a framework of the public university, underpinned by the principles of democracy, equality, freedom and social justice.This radical politics that underpin Student as Producer and promotes this social and collective approach recognises the need to defend and develop of other forms of public provision: welfare, housing, health and employment. Another key distinctive feature of this proposal is its transnational character, working with projects in the UK, Europe and Latin America. The research will operate in three languages: English (UK), Italian and Spanish. All of the events will have simultaneous translations, provided by the participants (this is common practice in transnational academic activist events), and will publish some materials in all three languages. This research project extends the HEA’s interest in Europe-facing activity to include student partnerships in Latin America. This desire to increase the scope of this Open Call’s geographical interest could be scaled back if it was thought to be too expansive, and for the research to focus on student partnerships and participation in the UK, Ireland and the rest of Europe. This would mean looking at eight learning sites rather than ten. While not working in Latin America would mean less value for money, the narrower geographical focus would still make for a highly significant contribution to what we know about student partnerships. Student as Producer recognises that the concept of partnership is itself problematic. Within the academic literature on Trade Union partnerships or Company Unions, the concept of partnership is regarded as a way to control and contain workers’ demands (Terry 2003). The concept of partnership is contrasted in the academic literature with more radical and militant action, where the demands of labour are seen as inherently in conflict with the demands of employers (Postone 1993). It is the position of this research project that this conflict is present in the nature of the relationship between students and higher education institutions. There is a considerable body of students who regard Vice-Chancellors and the NUS position on a number of issues as too close to government policy. For example, the issue of student fees, which provoked substantial student protests in England and Europe, with English students in the vanguard (Bailey and Freedman 2011). While Student as Partners is progressive in its aspirations its does contains the aspect of control and containment; this is apparent even in some Leadership Foundation literature on the subject of student partnerships which talks about encouraging a culture of ‘permission’ rather than ‘compliance’, without appreciating the paternalistic attitude that underpins such an approach (Trowler and Trowler 2011). The current response by government to student protests includes increasing forms of militarised policing and criminalising student activities (Graham 2012). Among students there is evidence of increasing dissatisfaction with undergraduate taught programmes that fail to engage with more academic critical perspectives. Students are asking for courses that teach more radical approached to the current urgent emergencies confronting the social and the natural world. For example, Manchester Economics students have asked for the free market syllabus to be replaced by a more critical approach to economics: http://www.theguardian.com/business/2013/oct/24/students-post-crash-economics, The Guardian November 2013). Student as Producer extends the range of the NUS manifesto: from ‘engagement to partnership’, to a spectrum that runs from ‘partnership to radical participation’. Student as Producer recognises the highly political nature of higher education policy. The current dominant policy discourse, including the language of student as partners and student engagement, presents the illusion of an already assumed consensus about higher education without any debate having taken place. This assumed government and media driven consensus points away from the notion of education as a free public provision to a society based on the marketisation of all aspects of social life, in a social world where no alternatives are allowed to be possible (Fielding and Moss 2010). The fragility of this assumed consensus was evident from the student protests of 2010-2011 and the coalition government’s decision not to go ahead with further Higher Education legislation to avoid further public debate and scrutiny on this highly controversial matter. This research project will cover higher education policy elsewhere in the world. e.g., Chile where the trend in higher education policy is moving back towards free public provision (Simbürger and Neary 2014). This trend has been driven by highly effective left-wing student political activity (Somma 2012). What all of this points to is that there is a very considerable level of student activity that falls outside the partnership model. The aim to promote student involvement through a restrictive interpretation of Students as Partners risks further alienating the very body of students that it seeks to engage. This kind of more radical politicised activity is often referred to in the literature as academic activism, and is based on the necessity of recognising the very strong connections between politics and pedagogy. Again, Rachel Wenstone has made these links in a series of presentations (rachel wenstone http://theinstituteblog.co.uk/2013/03/21/in-oxford-discussing-student-engagement-pedagogy-or-politics/). Student as Producer is neither a closed nor dogmatic framework of thought and action, but is open to critical review and adaptation of its own practices and principles (Neary et al 2014). Student as Producer has been taken up by a range of higher education providers and academics who have customised the approach to suit their own institutional circumstances. These include the University of British Columbia (Canada), Vanderbilt University (USA), Macquarie University (Australia), the University of Hertfordshire, the University of Leeds and Southampton and the University of Liverpool. In 2012 following a QAA review Lincoln was awarded a commendation for it support for learning enhancements, underpinned by Student as Producer, as well as recognising Student as Producer as an example of good practice in its own right ( http://www.qaa.ac.uk/ImprovingHigherEducation/GoodPractice/Documents/GPKB-case-study-Lincoln-2.pdf). Lincoln has recently completed NTFS project Student as Producer – research engaged teaching: an institutional strategy (2010-2013). Findings from this HEA funded project (Neary et al 2014 in press) support and consolidate the notion that students prefer productivist, partnership and participatory pedagogies, rather than the passive condition of student as consumers presented in recent QAA commissioned research (Kandiko 2013). Following the imposition of austerity and the pedagogy of debt after the financial crisis of 2007-2008 there has been an increase of alternative radical projects for Higher Education in the UK, Europe and transnationally. Alongside all of this is the rich history and tradition of radical alternative forms of higher education that have been developing in opposition to the neo-liberal university, particularly in Latin America (Canaan 2011). This project will build on the work of Mandel and Teamey: Enlivened Learning (http://enlivenedlearning.com/ 2012 – 2104) who argue that there is a silent revolution happening in higher education around the world, unseen not only in the media, but within universities themselves. Based on the work of David Orr (2009), they demand that the university has a key role to play in the creation of a decent, humane and sustainable future. However, in order for that to happen there needs to be fundamental changes in the way in academics and students teach and learn. This research will contribute to this ‘inter-cultural conversation’ through a critical engagement with the notion of partnership and, in particular, students as partners through a discovery of pedagogical activities that are attempting to create these fundamental changes inside and outside of higher education. The concept of partnership will be challenged and invigorated by notions of academic activism and militant teaching. This is potentially a very extensive project. In this case it will be focussed on sites of participatory learning in Higher Education: in Chile, Mexico, Italy, Ireland and the UK. This work could be developed at a later date as part of a global HEA project hopefully in partnership with the HEA. The learning sites in this project are University of Valparaiso, The University of the Land, Mexico; Edu-factory; University Nomada/Commonware; Social Science Centre, Lincoln; People’s Political Economy, Oxford; Fakultaet Null University, Berlin; Academic Activism MA, University of Leeds, Trade Union Activism, Oxford – Ruskin College; Public Advocacy and Activism, University of Galway. This research will explore the pedagogical practices that have been and are being developed formally and informally, inside and outside universities. The main purpose of the research will be to systematise this work and provide a framework for ‘a course of action’ (curriculum) to radicalise current teaching practices within UK HE providers. A key feature of what are now regarded as mainstream teaching and learning strategies were initially regarded as radical and even revolutionary (Pratt 1997). It is important to develop strategies that avoid recuperation and incorporation of radical pedagogies into the mainstream. This work is part of an expanding area of interest in this subject; for example, the recent call by Interface: A Journal for and about Social Movements 6 (1) for papers relating to The Pedagogical Practices of Social Movements by May 2014 by Sara Motta and Ana Margarida Esteves. The focus of Motta and Esteves is the impact of pedagogical practices on building social movements. The focus of this Student as Producer research is on critical pedagogy and popular education inside and outside HE, to develop a radical curriculum to deal with the many global emergencies that confront humanity and the planet (Orr 2009). Student as Producer takes inspiration, hope and motivation from the work of Motta and Esteves and seeks to contribute to what they are doing. The disciplinary range is based within the social sciences, but attempts will be made to find and promote academic/student activism within the natural sciences, particularly in relation to climate change (Orr 2009). From work already done in this area, for example, the work of Teamey and Mandel (2012-2104, it is clear that indigenous forms of learning do not follow the same disciplinary practices as liberal humanist-business universities, as they are based on a very different notion of partnership with land, history, culture and community. To further this aim the research will generate a series of outputs to support and develop academic/student activism. These will include the use of an online digital tool, Xerte (http://www.nottingham.ac.uk/xerte/toolkits.aspx) which can be used by academic activists to build their own open access learning and teaching resources. Another output of this research will be a new curriculum based on the principles and practices of critical pedagogy and popular education. The scope of the project is based on what can be realistically achieved in the period and with the allocated resources. This work needs to be constantly tested and critically evaluated against the original aims and objectives. The research will focus on two types of HE provision: i. within formal programmes being taught at Universities in the UK and transnationally ii. within informal projects not constituted as part of formal HE, but providing radical alternatives to HE provision in the UK and transnationally. Leeds MA in Activism and Social Change – Geography http://www.geog.leeds.ac.uk/index.php?id=170 This multi-disciplinary course brings together the worlds of academia and social struggle. It is run by academics working and researching with a variety of campaigns, social movement organisations and communities struggling against social and ecological injustice, and for a more equal, just society. The programme engages students in a questioning of the fairness and sustainability of the current capitalist world order and explore empowering ideas and examples of how to challenge the status quo. MA Ruskin – International Labour and Trade Union studies http://www.ruskin.ac.uk/course/84/1/Summary – Labour movements worldwide are seen as being in crisis and are actively seeking ways of renewal. These issues are closely linked with globalisation and with fluidity among emergent transitional and developing states and countries. Ruskin’s place in the labour movement, together with academic staff researching, writing and teaching in the field, puts it in a good position to become a centre of debate and scholarship in this project.The Ruskin MA offers practitioners and scholars of such challenges the conceptual, analytical and critical framework for understanding and explaining labour movement change. Public Advocacy and Activism – University of Galway https://www.nuigalway.ie/publicadvocacy/ The development of this innovative masters degree was prompted by the realisation that while there are many Management, Communications and Public Relations courses, none offers a focus on the issues and skills central to the role of those working in organisations which seek to shift attitudes and understandings in order to initiate change. The Masters Degree in Public Advocacy and Activism offers an advanced programme for those working, or intending to work, in international or local advocacy; including community organization, development, labour, rights, health, and environment. Contemporary human concerns, advocacy and proposed solutions increasingly transcend national boundaries and, in a globalised society, the role of Non-Governmental Organisations (NGOs) play an ever more essential role. Social Science Centre, Lincoln http://socialsciencecentre.org.uk/ The Social Science Centre (SSC) offers opportunities to engage in a co-operative experience of higher education. Run as a not-for-profit co-operative, the SSC is organised on the basis of democratic, non-hierarchical principles, with all members having equal involvement in the life and work of the SSC. The SSC studies themes that draw on the core subjects in social science: sociology, politics and philosophy, as well as psychology, economics, journalism and photography. The Centre organises study and research at all levels including undergraduate, Masters and Doctorates in Philosophy. The co-operative principles that guide the organisation of the SSC also extend to the ways in which we design and run our courses. All classes are participative and collaborative in order to ground inquiry in the experience and knowledge of the participants. Student-scholars and teacher-scholars have opportunities to design courses together, and those new to teaching and independent learning are offered generous support from others. All members are able to work with academics and other experienced researchers on research projects, and to publish their own writings through the SSC. One key guiding principle of the Centre is that ‘teachers’ and ‘students’ have much to learn from each other. People’s Political Economy, Oxford http://www.ppeuk.org/ People’ Political Economy (PPE) are a group of academics and activists based in Oxford and London. PPE is establishing a network of learning groups designed to promote political-economic literacy outside of the existing and established academic channels. In so doing, PPE hopes to democratise discussion over how our society is organised, why it is organised in the way that it is, and what can be done to improve it. PPE recognise that we live in difficult yet exciting times. The financial crisis of 2008 has imperilled countless livelihoods but has also opened a window of opportunity that has been closed for over a generation. Democratic deficits are increasingly more apparent, the legitimacy of our leaders is in question, and the ‘hallowed’ givens of our economic system are now up for discussion like never before. There are no easy answers to the questions that face us – ‘What has gone wrong and what can we do about it?’ – but the increasing polarisation of the political field, the rise of social disaffection and the massive daily challenges facing working people everywhere mean that now is the time to democratise discussions about our economic and political systems, to cultivate critical political economic literacy, and to build the informed citizenry fundamental both to any healthy democracy and to any project of concrete social action. Edu-factory – Europe http://www.edu-factory.org/wp/ Edu-factory is a transnational collective engaged in the transformations of the global university and conflicts in knowledge production. The website of this global network collects and connects theoretical investigations and reports from university struggles. The network has organized meetings all around the world, paying particular attention to the intertwining of student and faculty struggles. The model has involved circumscribed and thematically identified rounds of discussion: the first on conflicts in the production of knowledge and the second on hierarchisation of the market for education and the construction of autonomous institutions. After each round of discussion, the list closes to await a new opening in a successive cycle. In this way, Edu-factory moves from an extensive to an intensive mode of organizing networks. Edu-factory has proposed the project for a global autonomous university. They do not want to enter the education market. On the contrary, their aim is to open a process of conflict in the knowledge production system and its mechanisms of hierarchisation. From this standpoint, the global autonomous university is not simply an alternative university but a process to build up a transnational organized network of research, education and knowledge production, based on experiments and experiences that already exist across the globe. Fakultaet Null, Berlin http://www.fakultaetnull.org/ Fakultæt Null is a nomadic, parasitic anti-institution, temporarily implanted in the University of Arts Berlin. However, it can potentially be realised at any other university, school, academy, or educational institution. Fakultaet Null wants to create artistic, political, theoretical initiatives both within our education and beyond. Therefore they are appropriating existing contents and sources of information, claiming that education should be subject to free choice, instead of being regimented through modular study plans. All those who acquire knowledge within such a self-chosen mode automatically become students of Fakultæt Null. Fakultaet’s understanding of education is not restricted to pre-established educational services for ‘officially matriculated’ students. Fakultæt Null is also an attempt to make the university available as a resource for everyone. University of Valparaiso, Chile In Chile Higher Education programmes that enhance critical pedagogies and transformative thinking are quite often preceded by long academic disputes within universities on the issue of pedagogy and power. In cases of recent struggles against the neoliberal university and the commodification of education, the Student as Producer research project will encounter critical pedagogy in practice as it emerges in the context of student and academic activism, rather than as a formalised programme. A paradigmatic case for this is the recent students’ movement in Chile that started in 2011. Local student groups in Chile tend to organise their own teaching during times of frequent strikes. This is particularly the case in public universities. Valparaíso will be one site of participatory research where the Student as Producer research project will capture some of these aspects by arranging a collective remembering/writing project with respective student groups and academics who were involved with these strikes and the pedagogic practices they created. 1. What are the learning processes and knowledge production practices that promote participatory pedagogies? 2. How do these participatory pedagogies transcend traditional disciplinary boundaries to create knowledge and learning that supports sustainable and resilient partnerships between people, communities, the land and history? 3. What are the barriers to developing participatory pedagogies and how can they be overcome? 4. How can these participatory pedagogies be used to develop a more radicalised concept and practices of Students as Partners in mainstream universities in England and Wales? The aim and purpose of this research is not just to produce new knowledge but to produce ‘living knowledge’, or ‘the new composition of existing elements in a subversive social relationship: as something that is constituted through struggle, co-operation and radical practice. The purpose then is to turn the crisis of the university into a field of radical research in order to investigate and produce living knowledge’ (Roggero 2011 8). And, in this way, to renew and revitalise already existing forms of partnering and participatory and co-operative forms of higher education. It is intended to result in some action, change or improvement on the issue being researched (Pain 2004). Participatory Action Research (PAR) is vital for research about critical pedagogy and popular education. It assists the collaboration between the researcher and the researched, and, in the case of critical pedagogy and popular education, it encourages collaboration, partnership and participation between teacher and the student. While these methodologies encourage participation, partnership, self-reflection and involvement of the subjects of research at different stages of the production of knowledge, they are not necessarily anti-oppressive and emancipatory. Research must not only give ‘voice to the voiceless’ or to the ‘minorities’ but to articulate an emancipatory paradigm and must be anti-oppressive in nature, committed to social justice and resistance in process and in outcome. In this way the act of undertaking anti-oppressive research is in itself an act of emancipation that cannot be measured post factum as ‘impact’; it recognises that all knowledge is socially constructed and political and it is about power and relationships. Overall is not about ‘problem solving’, but, rather, about acknowledging the problem of uncertainty and ambivalence in the practice of theorising (Gibson-Graham 2006 xxxi). The establishment of a nexus between politics and pedagogy varies historically and geographically. PAR involves a ‘messy and evolving methodology’ that necessitates an engagement with the contradictions that emerge out our ‘praxis-oriented’ research practice (Chatterton, Hodkinson, and Pickerill 2008). In a very practical sense the benefits and possibilities of Participatory Action Research need to be framed in an awareness of practical problematic issues (Leeuw, Cameron and Greenwood 2012, Castree 2006, Demerritt 2000, Pain 2004) . For example, the most effective relationships between academics and activists occur over a period of time, creating relationships of friendship and trust. These important timescales can be compromised by the performative pressures under which academics are working, e.g., REF and other audit measures.This limitations identified in this form of research are much reduced, although by no means eliminated, by the fact that the main collaborators are already closely connected to the formal and informal projects which with they will be researching. There will be two connected phases to this process of partnership and participation: Phase 1 – in the UK setting out the parameters of the project Phase 2 – setting out the parameters of the participation within the sites of higher learning in Europe and Latin America. At least one member of the learning sites research group will have been at the phase 1 event in Leicester ( see timetable later). Each of the projects will be written up with members of the key participants and collaborating group having responsibility for specific studies. Ethnography: the research will be ethnographical, collecting social meanings from within the learning sites in which they occur through the use of a range of methods, including participant observation – not simply to extract information but to create a close and intimate familiarity as a way of binding the collective group participating in the research. The observations will be written and recorded by all members of the groups thus creating a multi-perspective analysis of the pedagogic activities, enhanced by critical and reflexive analysis of what has been reported and recorded. Dialogical interviews: again, not just extracting information, but generating new knowledge about those involved in the interviews and the context within which they are speaking (Freire 1970). Where these interviews take on a collective form the members of the group are encouraged to teach each other as a process of ‘intellectual emancipation’ (Ranciere 1991). This form of collective learning is the antithesis of focus groups. Live Methods: this forms of radical writing will be complemented by using digital tools for real-time and live investigation in a way that develops strategic forms of knowledge production and to make that knowledge accessible in ways that are appropriate to the practice they are recording in the public practice of social science (Back and Purwar 2012 14). All of the knowledge and meanings will be interpreted and analysed using content analysis. Whilst content analysis is usually associated with the analysis of texts into quantifiable content and categories (Bryman, 2004, 183) this research will be adopting an ethnographic content analysis (ECA) approach. Instead of attempting to offer an objective systematic and quantitative description of texts, Ethnographical content analysis emphasises the role that the researchers have in the construction and meaning of the texts (Bryman, 2004 182-183). The rationale for adopting this approach is that all members of the research group are heavily involved already as academic activists embedding critical pedagogical and popular education type activities inside and outside HE institutions. Thus, it is not only inevitable that the research group will interpret and construct the texts in a particular way but, also, the researchers have a wealth of knowledge and experience of working with critical pedagogy and popular education activities in their own practice that helps enrich the construction and meaning of the texts and images and films. In this way the collective research group can provide a more detailed and contextually rich description of what is happening and give a vivid account about the ‘state of play’’ (D’Andrea and Gosling, 2005 198) in and across these global sites of higher learning. The ultimate aim is not simply to produce knew knowledge but to systematize and document these practices and to provide conceptual, methodological and practical resources for activists, community educators and popular educators and critical teachers alike (after Motta and Esteves 2014). This research proposal will be sent for ethical approval through the University of Lincoln’s ethics process, specifically the Ethics Committee for Centre for Educational Research and Development before the project commences. Geography – Working with a group that is widely dispersed across Europe and Latin America. The project is designed to create a real sense of collective identity and purpose through regular meetings and the extensive use online social networking. Professor Mike Neary will act as a facilitator between the different research projects and be the point of contact for the project. There is considerable experience in the group of this way of working which should help to alleviate any possible negative consequences. Culture: The geographical issues are compounded by the fact that the project is working across different national cultures in Latin American and Europe. The differences in culture will be mitigated by the fact that the project is working towards very clear aims and objectives and the main participants are experienced in working in transnational contexts As well as national and cultural differences, there are also differences between academic and activist cultures, identified earlier in this report. This is mitigated by the fact that many of the academics working on this project are themselves activists. Politics: Higher education is a highly politicised area, even though this is not much discussed by academics as part of their formal academic life. It should not be assumed that all academics agree on the matters that form the core research problematic of this study, nor that they should regard a radical alternative to higher education as desirable. The intention of the project is not to dominate or impose politicised solutions but to open up spaces for collective dissensus (Readings 1997) in an environment when in English universities disagreement is not encouraged and key decision-making is becoming carried out by Senior Management Teams. 1. Two peer – review journal articles. 2. Critical reflective journal of collaboration based on ethnographic accounts of the participants, using ‘live methods’ (Back and Puwar 2012) and alternative forms of academic writing, e.g., social science fiction (Neary 2002), investigative journalism (Ross 2014), and autoethnography (Ellis 2004). 4. Booklet – Critical Pedagogy and Popular Education Stories hard copy and online in more than one language. 5. Conference – an international conference at the end of the project in the UK. 6. A major output is the creation of a supportive network of academic activists that will be maintained to carry out more work in this area. From what we know already know about the extent of ‘this silent revolution in higher education’ this project is barely scratching the surface. This timetable is arranged to carry through with the critical activities identified by Participatory Action Research. The timetable will be based on the need to create self-critical community of academic activists, using critical intelligence, praxis and a systematic learning experience. EVENT: May/June – Seminar in UK, Leicester with all of the Project Group with the purpose of establishing relationships, setting out agendas a frameworks for action, identify roles and responsibilities, collectively design research processes and tools, discuss outcomes and risks and workload. DOCUMENT: Milestones, June – Document from seminar/symposium – including ways of working, and research plans. This document is a key reference point for the project, building on the research proposal. RESEARCH: July – September – Field-Work Neary, Dinerstein and Roggero, together members of the Project Group, including students, already resident in those locations in Italy, Chile, Mexico and the UK and Ireland, to conduct research on ten earning sites. Neary will provide the connecting link between all of the reporting projects, travelling to and working in all of the research sites. EVENT – Milestones, September – Project Group event in UK, to report review and make further plans for research. Not all members of the Project Group will need to attend this event. Their absence will be alleviated by make extensive use of social on-line tools to reduce costs and travel. RESEARCH: October – December Second phase of interview and research, return to previous groups where necessary with further questions. There will be limited travel involved in this aspect of the project with extensive use of online social tools. EVENT: Milestones, December Meeting seminar/symposium in UK to review and plan for individual and collective writing project. Evaluate programme as a whole, including action and critical reflection, collectively identify future research and impacts. Not all members of the Project Group will need to attend this event. Their absence will be alleviated by making extensive use of social on line tools to reduce costs and travel. WRITING: January – March Collective rewriting and production of outputs and resources. No collective meeting required with extensive use of online social netwoworking tools. Maintain close contact through online social tools, and through regular meetings of Project Group. EVENT: Milestones, April 2015 Conference in UK – report on research project. Attendance at conference for students and activists funded through bursaries to be applied for from project costs. Readings, B (1997) The University in Ruins, Harvard University Press, Harvard Somma, N. (2012)“The Chilean student movement of 2011-2012:challenging the marketization of education”. Interface: a journal for and about social movements 4(2):296-309. This poster was designed to be presented at the Conference for the International Society for the Scholarship of Teaching and Learning in Liverpool in October 2010. 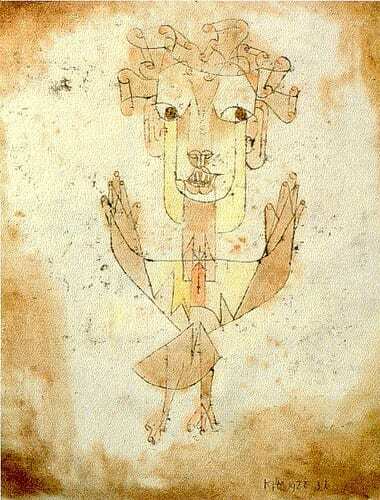 A Klee painting named Angelus Novus shows an angel looking as though he is about to move away from something he is fixedly contemplating. His eyes are staring, his mouth hangs open, his wings are spread. This is how the angel of history must look. His face is turned toward the past. Where we perceive a chain of events, he sees one catastrophe, which keeps piling wreckage upon wreckage hurling it before his feet. The angel would like to stay, awaken the dead, and make whole what has been smashed. But a storm is blowing from Paradise; it has got caught in his wings with such violence the angel can no longer close them. This storm irresistibly propels him into the future to which his back is turned, while the pile of debris before him grows skyward. This storm is what we call progress. — Walter Benjamin, “Theses on the Philosophy of History” in Illuminations (1940).